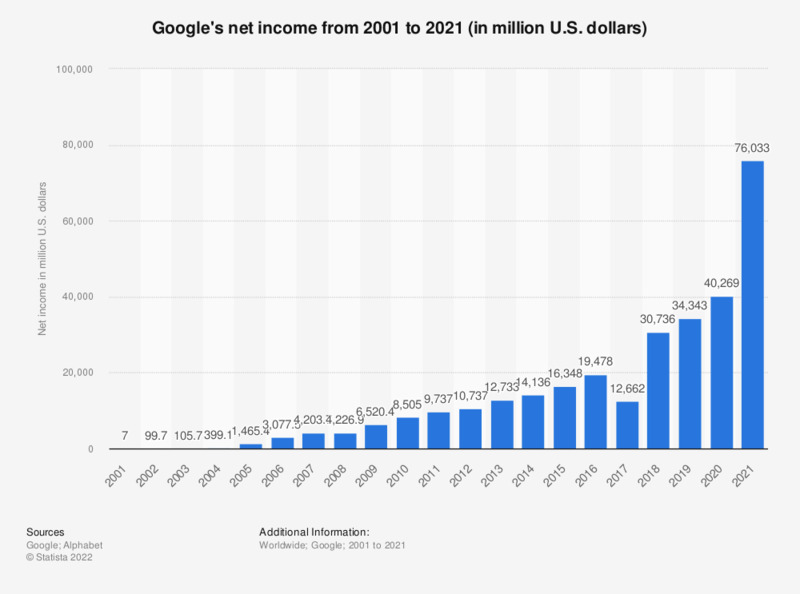 This statistic displays Google's net income from 2001 through 2015. In the most recently reported period, the internet company's net income amounted to 16.35 billion US dollars, up from 12.92 billion US dollars in 2013. That year, Google's revenue came to 66 billion US dollars. Since parent company Alphabet discontinued reporting a separate net income for Google, interested parties only have the operating income to go by. Google's 2016 operating income amounted to 27.89 billion U.S. dollars in 2016, up from 23.32 billion U.S. dollars in the preceding fiscal period. Alphabet Inc. is an American multinational conglomerate created in 2015 as the parent company of Google and several other companies previously owned by or tied to Google. Values regarding 2013 and 2014 have been restated to reflect this change. As of 2016, Alphabet stopped report net income for the Google segment. Everything On "Search engine usage" in One Document: Edited and Divided into Handy Chapters. Including Detailed References.